Send us your question and technical doubts relating to your Marital Problems. Q: When will my financial position improve? A: Period after October 2003 will bring prosperity. Q: Will I get admission for higher studies? A: It is not likely that you will pursue studies for full time. You may get into employment around the end of the year. You may continue your studies part-time. Q: Kindly suggest remedy for health and wealth. A: Visit a nearby temple daily. Perform Suryanamaskar regularly. Involve yourself in some social-service activities. Keep reciting Mrityunjaya mantra. Q: When will I get a good job? A: Your 10th lord is posited in the 12th without any benefic aspects. The 10th house is associated with nodes. So it is better to feel satisfied with any decent job. Keep accepting even temporary assignments. Right now, transit Jupiter and the nodes are crossing the natal positions. So going will be a little tough. Q: I am suffering from Fits. There is no complete relief inspite of medication. A: Your 6th house is aspected by a malefic and is bereft of benefic aspects. The 6th lord placed in the 5th is also not much desirable. Constant medical attention is a must. Recite Mrityunjaya mantra daily. Q: Will I get any assignment abroad? A: Even though your 9th house falls in a watery sign, the debilitated 9th lord may pose obstacles on your way abroad. Q: How will be my financial position in the future? A: The 2nd lord is in the 7th. The 9th and 11th lords are conjunct in the 12th. The above dispositions are not much desirable. Plan your expenditure carefully. Also look for new sources of income. Financial position will improve moderately after August 2003. Q: When will I settle down in life? A: Your 10th lord is posited in the ascendant. This is a very favourable disposition. Your 10th house receives benefic aspects. You will settle down in life after August 2004. Q: How are my career-prospects? A: Your ascendant and 10th lord Mercury occupy the ascendant. You cannot expect much benefits from the current bhukti and major transit positions. Be patient for a while. Promising periods are ahead. Q: Will I be able to settle down abroad? A: The 10th lord placed in the 9th is quite favourable. But it remains in debilitation in the navamsa. 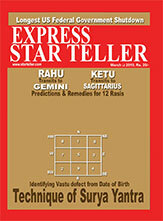 The current Jupiter dasa may not be very favourable. Don’t make any hasty decisions now. Be patient and continue in your present job. Major transits are also not going to be favourable for a while. Q: Kindly discuss my 9th house. A: Your 9th house falls in Virgo. Your fore-fathers must have been extremely wise and knowledgeable. You also love learning new languages and may even be multi-lingual. You may also show interest in subjects like chemistry, law, psychology, journalism etc. But your 9th house is aspected by malefics. So the positive influences get reduced. Your 9th house signifies auspicious and "lucky" circumstances which occur due to past karma. This house also interprets chances for foreign travel, higher education and guidance from a Guru. Q: I have experienced a lot of difficulties in my Moon dasa like discontinuances of education, un-employment etc. 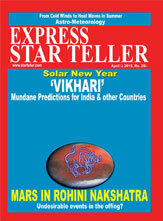 How will be my next Mars dasa? A: Better times are ahead. Mars is a great benefic to your Leo lagna and your Mars dasa will bestow many benefits. But its association with Saturn may drain some of its benefic influences. Q: To be very successful, what should I do? A: Believe in yourself and God. Keep your goals clear and remain steady in your pursuits. The association of nodes to your Moon may make you indecisive in important matters. Listen to your well-wishers before venturing into anything new. Keep meditating on Lord Vinayaka to guide you well. Mr. Prakash J. Mehta, Secunderabad. Q: How will be my future in films? A: Your Venus is quite strong and your creativity will surely get rewarded. Q: For financial prosperity, which stone can be worn? A: Pukhraj (Pushparaag) will suit you well. Q: I have experienced a lot of professional setbacks. A: Your 10th house and 10th lord are not well disposed. There will be some improvement in the 2nd half of Mercury bhukti of Saturn dasa. Mr. Yash P. Datta, Chennai. Q: I have been unemployed for the last 19 months. When will I secure a job? A: Currently you are passing through unfavourable Moon bhukti in Sun dasa. Transit Saturn is favourable till August 2001. Put in utmost efforts and chances to secure a job are bright in the latter half of the year. Mr. Awanindra Nath Dwivedi, Hissar. Q: When shall I get scientist’s job of I.C.A.R? A: Period after August 2002 is promising. Mr. P. Veeranna Sethy, Kakinada. Q: Which mantra and pooja will bring relief from sickness? A: If possible, perform Mrityunjaya Homa. Constantly reciting Mrityunjaya mantra will definitely bring relief. Sincerely pray to Lord Shiva, especially during Pradosha period, to regain health. Q: Could I become a doctor? A: Favourable planetary positions seem to fulfil your ambition. Q: Will business suit me? A: Your 10th lord Mercury is debilitated and associated with malefic nodes and Sun. It is better to opt for employment than to do business.